It’s not just for college kids, for those forever-skinny girls who declare their adorable unconditional love for pizza while folding their slice in half with sloppy fingers. It’s not exclusively for the single dudes living alone who suddenly, somehow, eat an entire pizza before they realize it (shout out to Derrik in the Navy! ), nor just for the newlyweds who burned their dinner again, nor the rushed families who order a large pie on their way back from hockey practice. It’s for me, it’s for the health-conscious, it’s for athletes, it’s for healthy kids, it’s for you. Paleolithic dieters can eat an entire pizza as long as the crust is made of cauliflower and the cheese is omitted (I think? Right?). 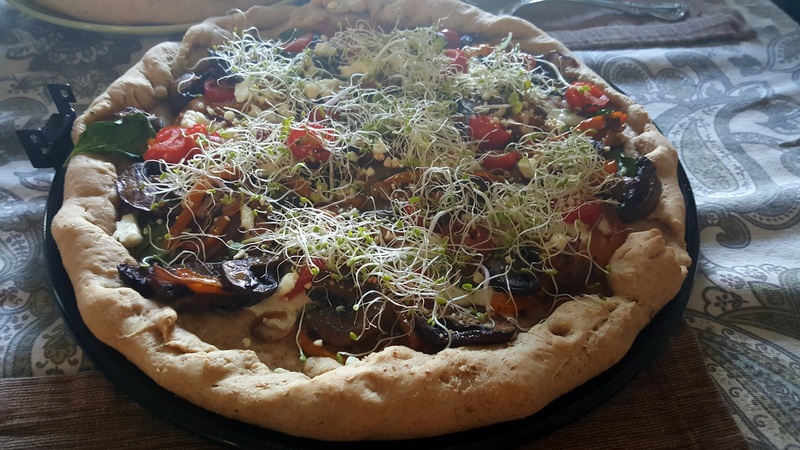 There are options for the gluten-intolerant, for vegans, for diabetics– pizza is so universally-loved that everyone has found their own way to tailor the delicious disk of perfection to their dietary restrictions. which involves warm water, yeast, flour, a few other ingredients, and about 2 hours of rising time. But I would be a dirty liar if I said that every second of it wasn’t completely worthwhile and thoroughly enjoyable. (Julia Child voice) Just look at it! It’s exquisite! In true Skillet Season fashion, I scrounge the fridge for a ton of vegetables on Pizza Night. Now in most of my recipes, I simply suggest a variety of textures and colors: cauliflower, zucchini, snap peas, bok choy, peppers, green beans– and the same reckless abandon can apply to pizza, too, but only with a touch common sense. Green beans on a pizza? It could work for the curious heart. Cauliflower? I’m sure it has been done, and done well. Allow me to share my favorites, though. Tomato season is upon us! Take advantage of this! Homegrown tomatoes make the kind at the grocery store tastes like gritty, sour, under-ripe fruit fed to orphans in fictional novels. When I bit into my first greenhouse-grown (from the earth, not hydroponic) tomato of the season, I seriously thought, “Huh. I could actually use this in fruit salad and it would work.” The sweetness of it! Or really, any leafy green. We use bell peppers because my children are a couple of nancies when it comes to spiciness. When they are grown and gone, I will use jalapeño in every single dish I make. Every meal. Even oatmeal. All right, this isn’t essential, but when you throw some sprouted radish greens on a finished pizza, you will never again plan a pizza night without adding these to the grocery list. Sauce? I could take it or leave it lately. Grab a jar of marinara or pizza sauce at the grocery store. Or just use olive oil. Cheese? The best mozzarella comes in “chubs,” but we’re adults now, ya know? So venture off. Feta works deliciously for this topping purpose, or Goat Cheese for the really mature pallet. Or read: Pizza for when you have 40ish minutes to make a pizza for dinner, and Pizza for open-minded kids, too. Tailor a second mini pizza or 1/4 of your own to the taste of your children. Pizza dough– make your own (we use this recipe), or buy a bag from the store. Make two or three pizzas and eat the leftovers all week. OR look up a cauliflower crust recipe! Preheat oven to 375° and set your round pizza pan, baking stone, or even a baking sheet on the counter. 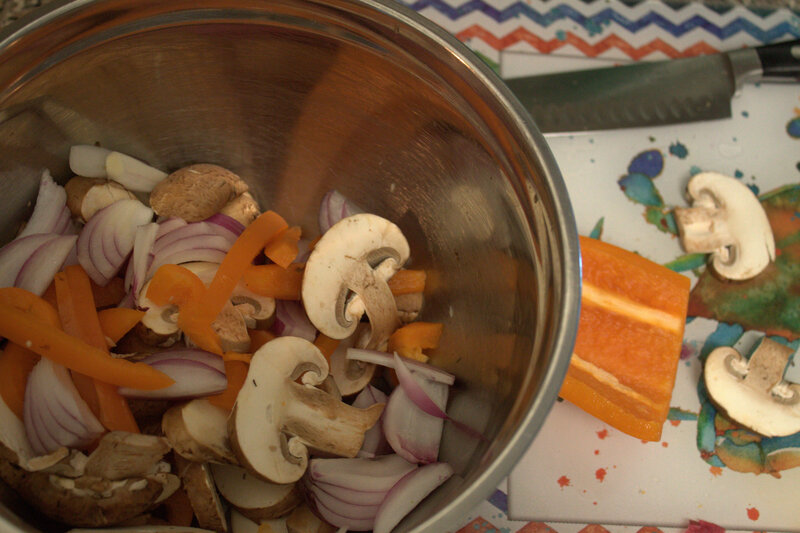 Toss the onions, peppers, mushrooms, and garlic in a bowl with 1 tablespoon olive oil, 1 teaspoon balsamic vinegar, the sugar, and the salt. Pour it onto a baking sheet and roast for 15-20 minutes or until soft. Meanwhile, roll the dough into the best circle you can manage. I never make perfect circles, but it’s pizza–no one complains about the shape of it. Pour another tablespoon of olive oil onto the crust and spread it around. 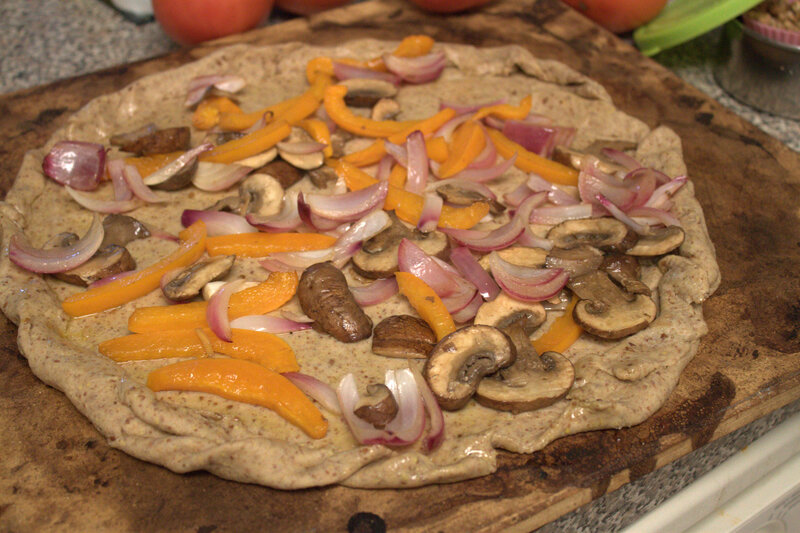 When the vegetables are finished, dump them onto the dough and spread them evenly over its surface. 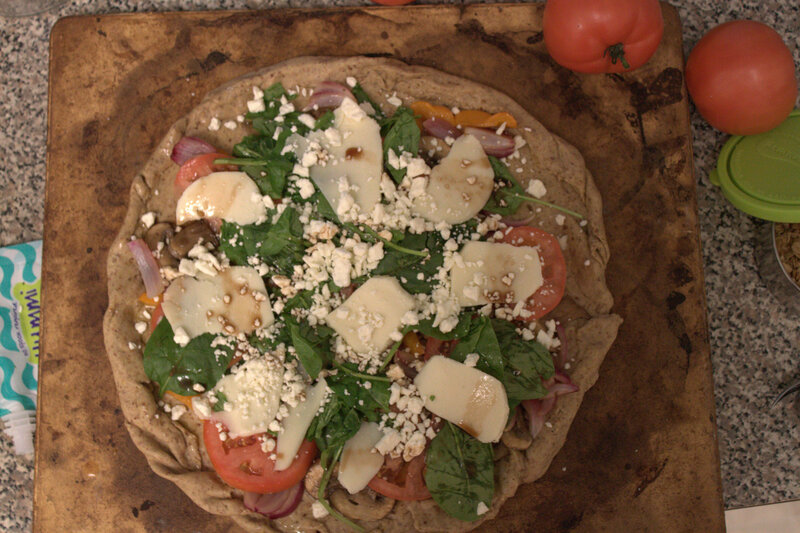 Top the vegetables with tomato slices, spinach, mozzarella, and optional Feta. Drizzle the last tablespoon of balsamic all over it. This grown-up adult pizza is ready for the oven, but feel free to add finishing touches. Fresh oregano and rosemary would taste delicious on this thing, or red pepper flakes. Bake for 22-30 minutes until the cheese is bubbly. Remove from the oven and top with microgreens. Cut it into 8 slices, pour some wine, play some jazz. Look at you and your hipster grown-up pizza! You’re stunning.